Thankfully we all had a very good sleep last night, I've never slept too well on boards before but I slept better than ever, maybe I was finally getting into holiday mode? Disembarking from the ferry was quick and easy, departing dead on 11:30 GMT. I wanted to take the first driving shift before nerves settled in, but very quickly we were on our way on the Motorway heading towards Bilbao. Our Garmin said the route would take 4hrs but we took a little longer, after 4hrs I was becoming tired and ached from the winding roads so we pulled over, had a picnic in the most beautiful lay by surrounded by Rioja vineyards and David took over for the rest of the drive. Zaragoza Ibis Styles Ramiro I to anybody. 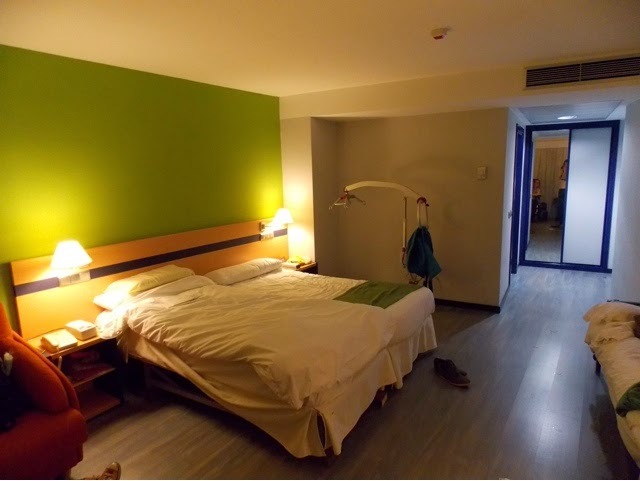 The room is really spacious, with a sofa to boot and free wifi and breakfast, and of course parking. The third bed is probably intended for the disabled guest as there is total access for hoist legs however I wanted to share the double with David so we've bumped up the legs of this one with wooden blocks from home. The bathroom is perfect for wheelchair access, a nice big deep sink without anything in the way of leg room, lowered of course. 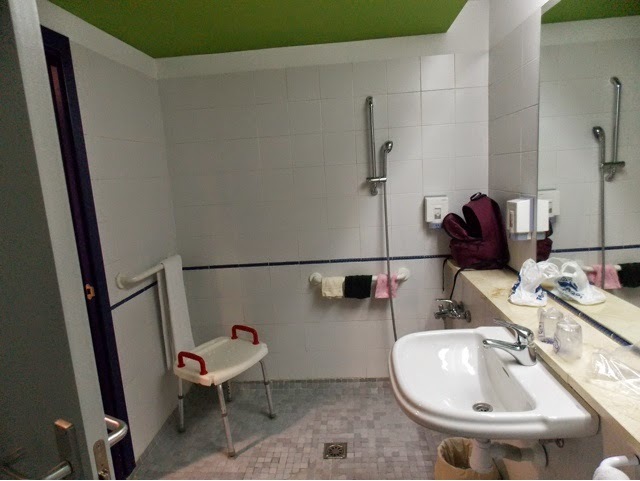 The wet room style shower is angled and the toilet is littered with grab rails, I'm all I'm over the moon with booking this hotel,band would return to another Ibis Styles. 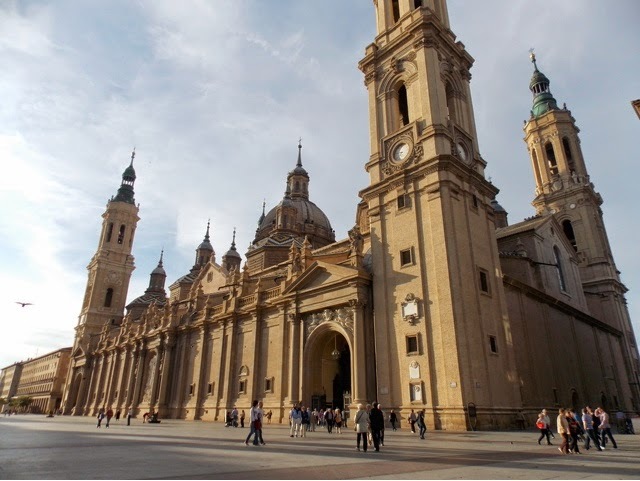 We have explored the sights of Zaragoza and what a lovely small city it is. We took a look inside the beautiful Basilica del Pillar, where we were fortunate to hear mass and the pews were full of followers. All accessible and very easy to manage in a wheelchair. 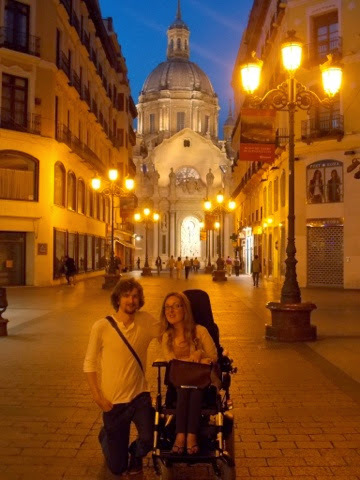 Infact Zaragoza itself seems to be really accessible, the roads are cobbled but the pavements and Piazzas are all tiled so very smooth, and everywhere has big shallow dropped curbs rather than the infamous short deep ones. This area is famous for its tapas and so of course we had to give it a go (not forgetting that it's already one of our favourite foods!) but be warned than many restaurants here have a rather large step outside them or they serve food on large upright barrels, we were happy to eat outside in the sunshine but it may be a problem for others in colder weather. For those who are interested: we had some deep fried calamari, toasted bread topped with cold tomato dressing, Russian salad (I had never heard of this but David was adamant that he's had it before and said it was nice, and so I'm set to make it for his work lunches when we are back to blighty) and a delicious local treat of grilled asparagus in a rich tomato sauce, with slices of crispy cod. Yum, we are such foodies, and will probably be reporting the food more than anything else!!! Thank you beautiful Zaragoza, you have got us into the holiday spirit and we are so happy that we visited you. Next stop, Barcelona. What a fun adventure you are on! I am the mother of a 14 mo old boy named Laszlo, who has SMA type 2. Your journey is so inspiring to me, and it is showing me that I can still dream big dreams for my little guy. Thank you for that and best of luck in your travels. Also, the food sounds delicious!